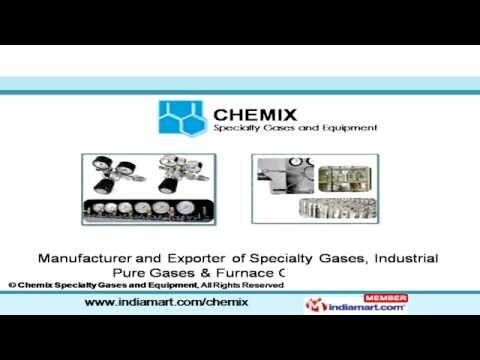 Chemix Speciality Gases & Equipment Welcome to Chemix Specialty Gases and Equipment, the leading manufacturer and exporter of specialty gases, industrial pure gases & furnace gas mixture. Established in 2006 as a proprietorship firm, our endeavors are directed towards ISO 9000 management system.We cater to various industries, including Petrochemicals, Fertilizers, Chemicals, Steel,Cement, Automobile, Engineering and more. Our range of products includes Ultra High Pure Gases, Calibration Gas Mixture, Gas Handling Equipment and many more. We offer Ultra High Pure Gases that are known for their features, such as Chemicalionization pure gas for mass spectrometry, Elemental analysis, Hydrocarbon feedstock, Instrument zero gases and many more. Our Gas Handling Equipment are appreciated for their Pressure Regulator, Gas Manifold, Gas cabinets, Valves, Gauges, Flow meters and many more. Some of the salient features of Medical Gas Mixture are Elemental analysis, Hydrocarbon feedstock and many more.The Instrument Gas Mixture is acknowledged for pressure regulator, purge system and flexible hose.We also offer Calibration Gas Mixture.